Georg Wilhelm Pabst's The Love of Jeanne Ney (Die Liebe der Jeanne Ney) stars Edith Jehanne as Jeanne, a young woman living in post-World War I Europe. After her father (Eugen Jensen) is murdered for espionage by her Bolshevik lover Andreas (Uno Henning), she travels to Paris to stay with her uncle Raymond (Adolf E. Licho) and his blind daughter Gabrielle (Brigitte Helm). While working at her uncle's detective agency, Jeanne encounters Khalibiev (Fritz Rasp), a sleazy conman who intends to marry Gabrielle, steal her father's money and murder her. Failing in this, Khalibiev commits another robbery/murder and leaves evidence at the scene implicating Andreas, newly arrived in Paris on Revolution business. Jeanne knows Andreas is innocent, having been with him on that fateful night, but she needs an additional witness to confirm the truth. She knows Khalibiev saw them together, and gives chase when he leaves town. The story here (adapted from Ilya Ehrenberg's novel) is standard issue melodrama, with enough violence and implied sexuality to justify its U.K. release under the more salacious title Lusts of the Flesh. There's a pre-code frankness to Pabst's directorial approach that makes for interesting viewing in and of itself, and Fritz Rasp's Khalibiev is at least as amoral and nasty a villain as, say, J.R. Ewing, going so far as to solicit a kiss from Jeanne while his blind fiancée strokes his hand on the other side of the table. Bloodstains and corpses are revealed onscreen, and personal morality is treated more flexibly here than in contemporary Hollywood productions. But these darker plot elements, while surprising, are not nearly as forward-looking as Pabst's cinematography. The Love of Jeanne Ney relies very little on intertitles, preferring to tell its story with visuals - close-up shots of handwritten notes and newspaper headlines (often replaced with English-language versions) communicate most of the specifics, while gestures, expressions and actions deliver the human component. Images of mounted armies and bustling cities lend an epic feel to what is essentially a love story under duress, a tale of lovers whose time together is a luxury, not an entitlement. The lead performances are fairly subtle by silent film standards, with naturalistic facial expressions and gestures, though there's plenty of room for mugging on the part of greedy Uncle Raymond and the vile Khalibiev. The film's sophisticated, accelerating pacing seems ahead of its time (aside from some intertitles that overstay their welcome), and Pabst constantly raises the stakes, even as he keeps the film's conclusion unpredictable. There are even a few bits of humor to enliven what would otherwise be a very dark experience. The Love of Jeanne Ney is billed as "a major rediscovery of silent cinema" on Kino's keepcase copy, and this release (produced by David Shepard) substantiates the merit of the claim. With so many early films now lost to the world, it's great to have this highly cinematic product of the silent era on DVD. Image Transfer Review: The Love of Jeanne Ney is presented in its original 1.33:1 full-frame theatrical aspect ratio, drawn from a print billed as the "longest version available anywhere" (though the 113-minute running time listed on the keepcase is about 8 minutes too generous). The source print is surprisingly clean for a film of this vintage - it has a number of splice jumps, running scratches, and damage flecks, but it's in much better shape than many "rediscovered" works of the silent era. The DVD uses interlaced video to simulate the proper silent film projection speed, a compromise necessitated by the DVD format's inability to handle arbitrary frame rates. The image is slightly soft (much more so in some scenes than others) and deep blacks are extremely rare, but these flaws are acceptable given the presumable condition of the source, and nothing seems to be obscured by the digital transfer. A decent presentation of a vintage silent film. 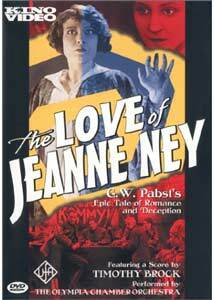 Audio Transfer Review: Kino's The Love of Jeanne Ney DVD provides this silent film with a fine stereo score by Timothy Brock, recorded in 1993 by the Olympia Chamber Orchestra. The music is crisp and clean, with good frequency range and solid stereo imaging across the front soundstage, and Brock's dramatic, highly specific score enhances the presentation tremendously. There's a brief bit of percussive noise in one section that sounds eerily like static, but that's a minor quibble with what is generally a very nice soundtrack. Extras Review: Unfortunately, though not surprisingly, Kino was not able to scare up any extra material for The Love of Jeanne Ney. 16 picture-menu chapter stops are provided, and there's a link to Kino's website on the title screen. This link seems intended for DVD-ROM users only, as it produces no visible result on set-top DVD players, aside from a brief pause. G.W. Pabst's The Love of Jeanne Ney is a silent era romantic melodrama, enhanced by strong cinematography. Kino's DVD transfer is competent, with an evocative orchestral score by Timothy Brock, and the film is worth a look.